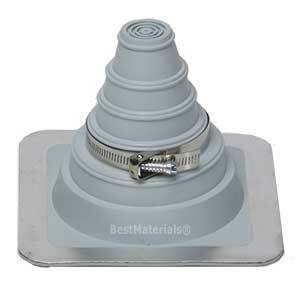 PRODUCT: #1 DECK-MATE GRAY GRAY COLOR EPDM BOOT WITH STAINLESS STEEL CLAMP. 4.8 x 4.8 BASE, 3-7/8" HIGH, CLOSED TOP. FITS 1/4" - 2" (6.3mm to 50.8mm) PIPES. PRICE/EACH BOOT (15 boots/case). DESCRIPTION: Pipe boot is molded with a 5/8" sealing band for each pipe size. An adjustable stainless steel pipe clamp (included) tightly clamps any pipe size selected and forms a permanent seal. Flexibility: The flexible base is virtually compatible with any roofing material -- metal, plastic, asphalt, tile, rubber membrane, and easily conforms to irregular surfaces. Reinforced Base is reinforced with a heavy-duty aluminum alloy clamp ring for flexibility and a tight seal at the base. Roof Pitch-Adaptability: Stepped-pipe design makes easily adaptable to most roof pitches. Manufacturer provides 20 year limited warranty. SELECT and TRIM: Choose Deck-Mate with that MATCHES pipe diameter. If necessary trim opening to match the larger pipe diameter options for that boot. SLIDE: Clean pipe then slide down over pipe. FORM: Press down, bending it to conform to roof profile or roof irregularities. A blunt tool will help press flashing into tight roof angles. SEAL BASE: Apply a bead of M1 or Duralink sealant between base and roof. FASTEN: Use exterior grade fasteners (stainless are recommended) with sealing washers to complete sealing. For UPC installation, fastener spacing may not exceed 1-1/2" (38mm). SEAL PERIMETER OF BASE: Apply a bead of M1 or Duralink sealant around the perimeter of the base and roof. APPLY CLAMP AT TOP: Attach Stainless Steel Snap Lock Clamp and tighted.